Along with being able to play Total War: Warhammer, Dark Souls III and heaps more of the newest releases in 2016, we've been announcing developer sessions at the inaugural PC Gamer Weekender all week, along with competitions, free games and more. Tickets are just £14.99 for the day, and you can save 20% off when you use the discount code PCG20 at checkout. Join us at The Old Truman Brewery in London on March and 6 and check out the amazing line-up we're building here. Valve and HTC's cutting-edge virtual reality rig is coming to the PC Gamer Weekender. 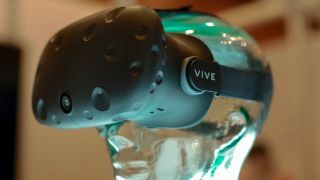 Four booths will offer visitors a chance to sample the Vive's unique brand of full-body virtual reality, powered by four corner scanners and motion-sensitive handheld controls. Scan are taking over an area at the PC Gamer Weekender to present great offers on new PC hardware. If you don't fancy shopping, don't worry, they're also bringing a cool toy: the VRX racing simulator. Esdevium Games and GamesQuest will be filling the basement of the Old Truman Brewery with fantastic boardgames like X-Wing and the frantic Dobble. Perfect if you fancy something different between gaming sessions. Wargaming will be taking to the stage to talk about their revival of the classic 4X space strategy game, Master of Orion. WG Labs' publishing product director Maxim Matveyko will discuss how Wargaming have been working with the original game's creators to bring the series back. Get an exclusive look at Deep Silver's CryEngine-powered open-world shooter, Homefront: The Revolution. Philadelphia has been taken over, and it's up to you and a few friends to take it back, with fire. Lots of fire. Meet the developers at Foundry 42 creating Star Citizen's ambitious single-player component in our on-stage developer session. Find out what's ahead for one of the biggest games coming to PC in the next few years. See Paradox's brand new sci-fi strategy game on-stage, presented by the developers themselves across both days of the Weekender. Play any Sega game at the event, get a free game. In addition, you get a free game with every ticket purchase courtesy of BundleStars. So that's a guaranteed two games to have forever for your ticket price alone. Plus, there's a chance to win every Sega game on Steam! As the first episode of the new, shinier and sandbox-ier Hitman prepares to hit Steam, get an exclusive taste of what's to come in this never-before-seen footage of the game, presented live by creative director Christian Elverdam. The developers at Tripwire Interactive will be at The Old Truman Brewery to talk about the future of their Early Access FPS, as well as Rising Storm 2: Vietnam. Come try Killing Floor 2 out for yourself, too. The team behind the sequel to one of the best RPGs in recent years will be on-stage to talk about the much-anticipated Original Sin 2. Come challenge other players at Rocket League and Street Fighter V and win prizes, as well as respect from your peers. See the sequel to one our favourite strategy games in action for the very first time, presented on-stage by the fine devs at Mode7 Games. Everything you need to know to build, tweak or customise your PC hardware—we'll be running hardware workshops on both days. Dark Souls III, Umbrella Corps, Worlds Adrift, Total War: Warhammer, Warhammer 40k: Eternal Crusade and so many more—check out our comprehensive list of every game you can play in London two weekends from now.